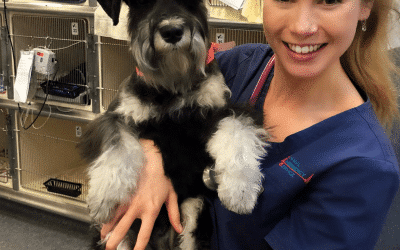 Dr Brooke Schampers grew up in Brisbane, and for as long as she can remember she has always had the dream of becoming a veterinarian and helping animals. At the end of high school, she made the big move to Townsville to study Veterinary Science at James Cook University. During her degree, Brooke spent every holiday volunteering at the Animal Emergency Service, falling in love with emergency medicine and critical care and saving lives. She ventured to America to gain further experience, particularly in the intensive care units, being mentored by some of the world’s most experienced veterinarians. She aspires to obtain Membership with the ANZCVS in the Emergency & Critical Care chapter, and lecture university students on all things emergency and also on the importance of a study/work-life balance. She also contributes to the AES blog page and inspiring students and new graduates alike via her successful Instagram page. When Brooke isn’t working, you will usually find her at the gym, spending time with family and friends or brunching with her Cavoodle – Polo.